Thanks to the Pixiwoo sisters Sam and Nic, I found out that Jessica does great Chanel nail polish dupes! 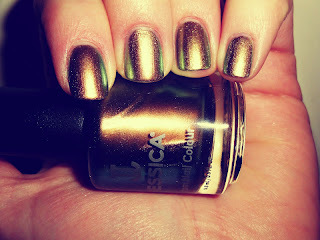 I will link their youtube video right here... Basically Jessica Iridescent Eye is a dupe for the Chanel Peridot [Fall 2011 collection]... When Peridot first came out I found the colour interesting and loved how different it was to Chanel's usual nail colours, but I never was certain it would work on me... 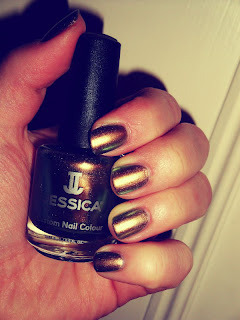 But because Jessica is half price compared to Chanel nail polishes, I decided to take a risk and finally get this colour! Funny enough on the day I went to pick up Iridescent Eye, I also saw OPI had exactly the same colour in their current Spider-Man Collection, called Just Spotted The Lizard... And also Ciaté Oil Slick is identical to Peridot... I actually ended up quite liking this colour, it's a golden/green metallic duo-chrome... It does clash with the outfit, so you kind of have to pick something that goes with it, but otherwise it's pretty cool..